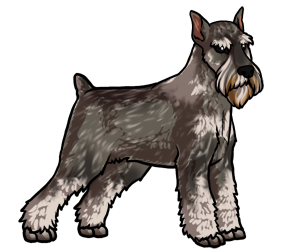 The Standard Schnauzer originated in Germany where it was bred from Black German Poodles and German Pinschers. The puppies created could be classified as either German Pinschers or Schnauzers depending on their coat type and were often in the same litter. During the 19th century, German dog fanciers began to recognize the breed and then required that all puppies in three generations must be coarse furred in order to be registered as a Schnauzer in order to be registered as a Schnauzer by the German Pinscher Schnauzer Club. The breed was used in many aspects of farm life including livestock guarding, vermin hunting, companionship, and guarding the family. Today the Schnauzer is an affectionate, energetic breed that becomes very attached to its family. The Standard Schnauzer is the original of all three schnauzers. The word "schnauzer" comes from the German word "Schnauze" which means "muzzle," referring to the long fur on the schnauzer's muzzle. During World War I the Red Cross used Schnauzers as guard dogs.